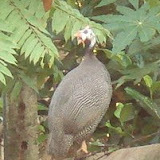 These are pictures of a huge bird, seen in our my backyard this morning at Kelaniya. The bird was almost 1.5 feet tall (the distance between the holes of the barbwire post to the right of the bird are roughly around 9 inches - the bird spans about three of these). Looking forward to some comments and feedback from someone more conversant on Sri Lankan birds - I have no idea what this one is called.